Phileas Fogg accepts a wager that he can’t travel around the world in eighty days, but it looks like trouble when Fix trails him, believing him to be a suspected gentleman thief. Translator & Critical Material: William Butcher. The World’s Classics. Oxford & NY: Oxford University Press, 1995. xlv+247 pages. Since the original English translation of this novel done in 1873 was of good quality, the merit of Butcher’s work on this text comes less from his translation—excellent though it is—than from his close examination of the original manuscripts and his first-rate analysis of how this famous novel came to be what it is. Discussing, for example, Verne’s initial ideas for this work, his orchestration of the complex interplays of time and space in it, certain (never before noticed) undercurrents of sexual desire and psychological ambivalence in the story’s main characters, and the masterful use of humor and satire throughout, Butcher’s critical introduction is one of the most interesting I have read. 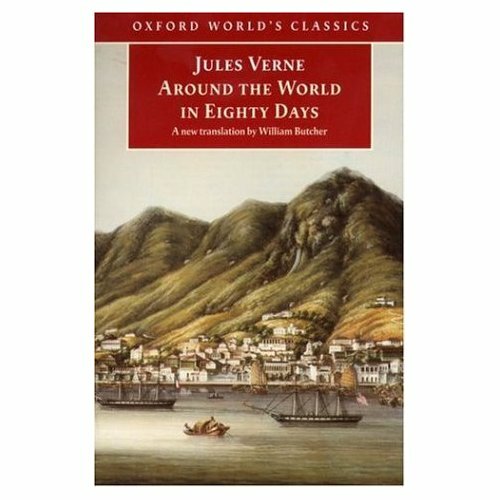 This introduction, coupled with a select bibliography, a chronology of Verne’s life, more than 30 pages of explanatory endnotes, and three very informative appendices (“Principal Sources,” “The Play,” and “Around the World as Seen by the Critics”) make Butcher’s and OUP’s version of this classic Verne text by far the best available, in either hardcover or paperback. -- Excerpted from Arthur B. Evans, “Superb Jules Verne Translations,” Science Fiction Studies, 22.2SS #66 (July 1995): 288-89. Translator & Editor: Michael Glencross. London, England: Penguin Books, 2004. 288 pages.